I’m a professional writer. Are you? Thousands of dollars in taxes can often ride on a single question: is a writer a professional or an amateur? One of the things I’ve written recently is a new white paper for my client 1800Accountant.com that details the rules that state and federal tax authorities use to determine the tax status of writers. The white paper is available free on the resources page of the 1800Accountant.com website. Whether you are a novelist, blogger, freelance journalist, poet, technical writer, copywriter or non-fiction writer, if you earn your living by writing copy on spec or on assignment, how your craft is defined by the tax authorities makes a big difference. Amateurs or hobbyists – writers who keep a journal to help them make sense of life, for instance, or those who write fan-fiction that is not intended to earn money – are not entitled to tax deductions for the costs incurred in their writing. Professional writers – those who support themselves and their families in whole or in part from the income earned from their writing, or hope to do so within a few years – can deduct the costs they incur while creating their work. Simple, right? But what if you’re writing a first novel, or investigating a complicated issue for a series of non-fiction articles or book, and you are spending money without immediate income. Can you deduct expenses related to that “speculative” work from income earned from other projects? What if your blog isn’t making money (yet), but you hope to monetize it later? The answers to those questions and many others are in the white paper, prepared with help from the tax experts at 1800Accountant.com, the leading national resource for home-based businesses and freelancers of all kinds. I learned a lot while writing it, and I’ve been filing taxes on income earned at least in part as a writer for over 40 years. 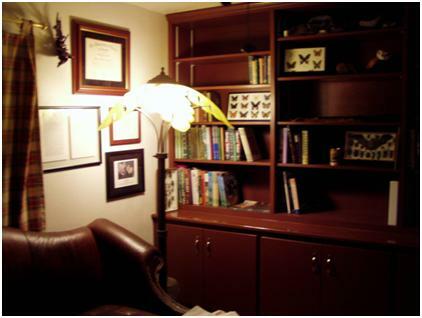 My husband and I hired a top interior designer to create a custom home office complete with designer furnishings, antique light fixtures, framed memorabilia, collectibles and three walls of built-in bookshelves. Because most of the designer touches weren’t necessary business expenses, they weren’t deductible. The cost of the dedicated Internet connection and phone line, extra power outlets, and new computer gear are treated as deductible expenses under multi-year business depreciation rules. We can deduct the costs of operating our home office each year. What if I Fail the Profit Test? The new white paper is now available for free download on the Resources page of the 1800Accountant.com website. There’s also a separate white paper for artists, musicians, singers, actors and other performers on the same website. Photo credit: I snapped the photo of one corner of my home office. ©2013, Deb McAlister-Holland; all rights reserved. Do not reuse without written permission. FTC Disclosure: I was paid by 1800Accountant.com to write the white papers discussed in this blog post, but was not paid to promote them on my personal blog. I’m sharing it here because I want to help other writers pay less in taxes on the money they work so hard to earn. Gallery | This entry was posted in Management & Entrepreneurship and tagged blogging, Deb McAlister-Holland, IRS rules for bloggers, tax deductions for writers, tax myths writers believe, writing. Bookmark the permalink. 12 Responses to Are You a Professional Writer? Would the IRS Agree? I’m now not certain where you’re getting your info, but great topic. Thank you for wonderful information that I was looking for. Thanks , I’ve just been looking for information about this topic for a long time and yours is the best I’ve found out so far. But are you sure about the home office deduction not triggering an audit? I’ve always read that it did. Great post! Thanks for sharing! When I first started, I had to simply concede my office would not be tax deductible. I only use it for my business, but I do occasionally use it as a non-business reading room (not to mention the few craft supply tins that have walked in without my consent…). Can’t wait to read the whitepaper. Hopefully, it has the link to that flat-rate deduction you mentioned. Hi, Jessica — no link needed re the flat-rate deduction. It’s a simple calculation, with the explanation right on the self-employment tax form. For once, the IRS made something easier! You are still limited to deducting only space used exclusively for business, however. So although we have two home offices in our house (mine and my husband’s), we can only deduct one because the other doubles as a movie room and has the big-screen TV & recliners in it. Thanks for visiting and taking time to comment!